With Italy as inspiration, Campiello chef Chris Dmochowski creates a menu seeking to delight diners. Campiello chef Chris Dmochowski in the kitchen of the Eden Prairie restaurant. Chris Dmochowski, executive chef at Eden Prairie’s Campiello restaurant, came to the highly respected D’Amico family after a varied culinary career that took him all over the United States for the past 16 years. “I was a bit of a gypsy,” he says. Raised in Michigan, he moved to Arizona to attend Scottsdale’s Le Cordon Bleu College of Culinary Arts. After a stint in Minnesota, he worked in Florida for a while before moving back to the Twin Cities and taking a job at Tejas. But even with a number of family members who had migrated to the Twin Cities by then, he still wanted to experience other parts of the country. “I got happy feet and went to Florida,” he says, adding that he spent six days and 80 hours a week working in a small bistro in Orlando. 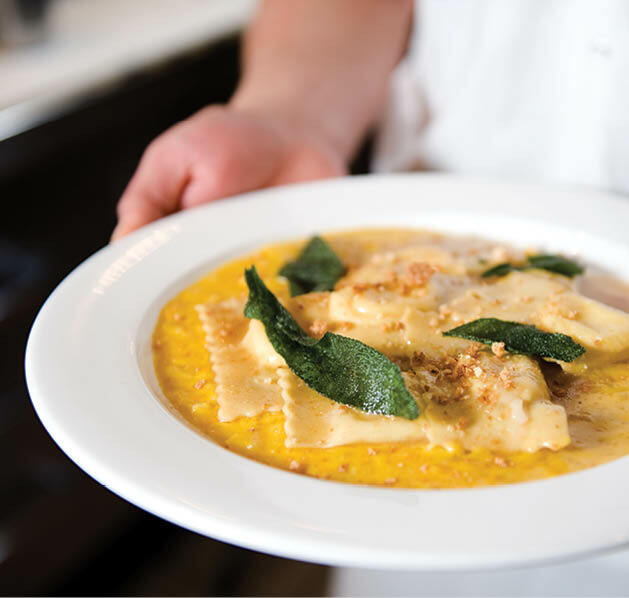 New winter dishes include items such as winter agnolotti with winter squash, sage and brown butter, or a filet with white truffle potatoes. “These are very warming dishes, very comforting,” he says. When possible, he works with local producers, especially in the height of the produce season. “I get hydroponic tomatoes from Living Waters, our pork is Minnesota-raised, our lamb is from Iowa,” he says. But when something isn’t grown or raised in Minnesota, he’ll look for the best source elsewhere, such as getting fava beans from California. Yet whatever he’s using, whether from central Minnesota or from California, it’s not mass-produced. One way he does that is to rethink traditional preparations. “It’s just a matter of differentiation,” he says. “I’ve done a beet salad where I used shaved raw beets rather than the traditional roasted. Or in fall, I’ve done a butternut squash salad the same way, raw and shaved, rather than roasted.” The variations are delicious, and discerning diners appreciate the creativity.